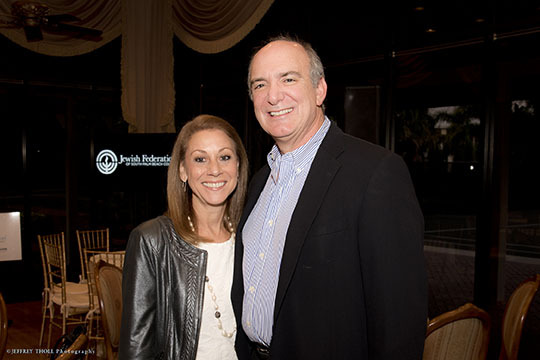 The Jewish Federation of South Palm Beach County inaugurated its newly branded Prime Philanthropists group (P2), on October 26. More than 70 guests attended a “Cocktails, Conversation and Community” event at Les Jardins Clubhouse in Boca Raton. Rabbi Josh Broide and Rabbi Daniel Levin led an interactive discussion centered on “love thy neighbor as thyself” and spoke about the importance of community. Chaired by Ilene and Peter Wohlgemuth, P2 offers major donors the unique opportunity to participate in high-level briefings and exclusive educational, cultural, social and travel experiences with local and national peers as part of the Jewish Federations of North America’s Joshua Society. For more information, contact Felice Naide at felicen@bocafed.org or 561.852.6084.